Jonathan Hickory is a Master Police Officer in Charlottesville, Virginia. In his 15 plus years of police experience, Jonathan has mentored and instructed other officers in police driving methods and as a Field Training Officer. Jonathan spent seven years investigating the reconstruction of fatal vehicle crash sites and three years as a motorcycle officer. Jonathan proudly serves as a member of the Police Department's Peer Support Team providing Critical Incident Stress Management support to fellow officers. He also leads a Life Safety team with The Point Church in Charlottesville and the local chapter of the Fellowship of Christian Peace Officers. Jonathan has been married to his wife Stacy for over 14 years and has two children. As a veteran officer, Jonathan has worked the streets, facing the darkest moments of humanity. After battling alcoholism and PTSD related depression for years, he found himself in the middle of the ultimate battle of good versus evil; the battle for his soul. After allowing the enemy to destroy his life and his family for years, Jonathan cried out for help from the only One who could save him. Turning to God has given Jonathan a new light in the perpetual darkness. As an author and speaker, Jonathan now helps others who are struggling with the difficulty of surviving this fallen world. Jonathan continues to speak life into others as he shares the power of what God can do. 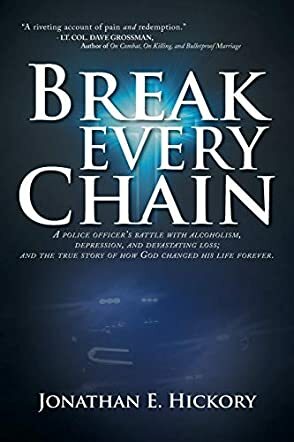 A real story with real pain, loss, suffering, and heartache, Break Every Chain: A Police Officer's Battle with Alcoholism, Depression, and Devastating Loss; And the True Story of How God Changed His Life Forever by Jonathan E. Hickory takes readers on an emotional ride through his experience of grace. It’s a tale of hope and inspiration that shows the inscrutable workings of God in the life of a man set for self-destruction. Meet the protagonist, a veteran police officer battling with his demons; an alcoholic who struggles with depression and whose anger, infidelity, and PTSD push him to hurt his wife and daughter deeply. But it is his path to healing that is fascinating. Readers encounter a human being, a law enforcement officer who, after the painful loss of his father at an early age, witnessed so many dead bodies in his line of duty. When he lost his own son, the failure to make sense of the loss drove him towards a dark path. In this memoir, he chronicles the painful journey towards hell and redemption with unusual honesty and clarity. The writing is filled with light and the author's sense of humanity is captured with unusual finesse and style. From the very start of the narrative, Jonathan describes an emotional moment of pain between him and his wife, Stacy, and the words that stirred him right to the depths of his being: “I hate you! Everything you ever say is mean, and we don’t deserve to be treated like this! We are your family!” He notes the effects of this statement in the words that follow: “I was a monster and I was destroying my life and hers.” Break Every Chain is deftly written; a moving memoir filled with hope and light. Honest, compelling, and inspirational.